The Democratic Party in Lebanon County needs your support to grow and promote our Democratic values and ideals. There are many ways to make a difference. I thank those of you who volunteer time and resources, especially during this past election. The Century Club is one of our vital sources of funding to support and maintain our presence in Lebanon. The Party needs resources to maintain our facilities and operational expenses, support local, state, and national candidates and conduct outreach for voter registration and participation. To be recognized as a Century Club member we ask for a contribution of $100 over the course of the 2019 year. Contributions can be made starting in January and will accumulate throughout the year through monthly donations or sponsorships at our Spring & Fall dinners (half of your dinner registration cost is counted as a Century Club contribution). All in-kind donations are also credited towards a person’s membership level. Your support is vital. While we wish that everyone could make a contribution of $100 or more, we realize that is not always possible. We welcome any amount of support you can make at this time. Contributions throughout the year will be added towards your total goal and membership in 2019. Century Club membership benefits are listed on the chart on the attached chart along with a contribution/pledge form. Plan to make your contribution or pledge by March 15, so you can enjoy the benefits of membership starting with our Spring dinner. 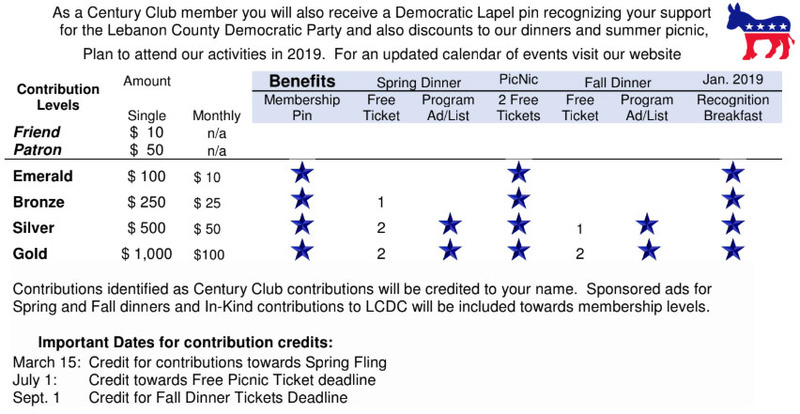 You may contact me or any member of the Lebanon County Democratic Executive Committee with questions about the Century Club and how you can support your Party as we move forward in 2019. Prefer to join by mail? Click here to download our 2019 pledge form. political event, Anna was there for us for over 40 years. recognized her as their Woman of the Year. Anna passed away January 15, 2013, and our Century Club was soon named in her honor. Born September 11, 1927 in Lebanon, Anna enjoyed her children, grandchildren, and great-grandchildren, but she also managed to put in over 35 years working for the Quality Inn. She was a member of St. Mary’s Church, the PA Council of the Blind, and the American Council of the Blind. And I am told she enjoyed bingo and puzzles in her spare time….. 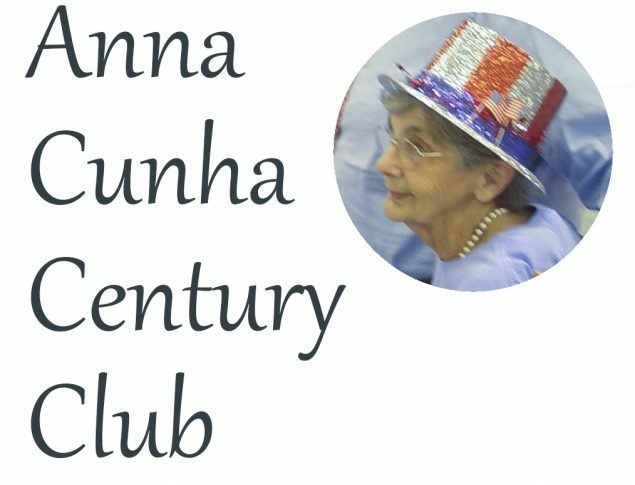 It is fitting that we recognize her as we build our Anna Cunha Century Club membership.